This project is so simple that it will make even the most unskilled DIYers shine. Be prepared to amaze your husband, astonish your supervisors, make some hens happy, and save enough money that you'll earn a free night out on the town for all of your hard work. STEP 1: Buy some chickens, therefore creating the need for a chicken feeder and giving you the opportunity to shine. STEP 3: You will need a bucket with a lid and some kind of tray. We happen to have several hard plastic buckets with tight fitting lids in the barn left over from horse supplements. Many grocery stores and delis give the same kind of buckets away if you just ask for them. The tray will need to have a lip on it and be bigger than the bottom of the bucket. I used an old cheap galvanized dog feeding pan that I found, but you can also use the plastic flower pot bottom trays or anything similar. If you are walking around your yard in search of these objects, make sure you look like you are on a mission and working really hard if your husband is watching. This is what the husbands do on the weekends when they say they are working on tasks on their Honey-Do lists. STEP 4: Rummage through your husband's junk cave workshop and try to find a drill. Grumble and gripe and trip over stuff and bang your knee and get grease on your face (the magic of the junk cave workshop is that you never get out of it without grease on something) while you are looking for his stash of nuts and bolts... which shouldn't be hard to find because they are undoubtedly everywhere. Take a deep breath, gather yourself, and dive in. 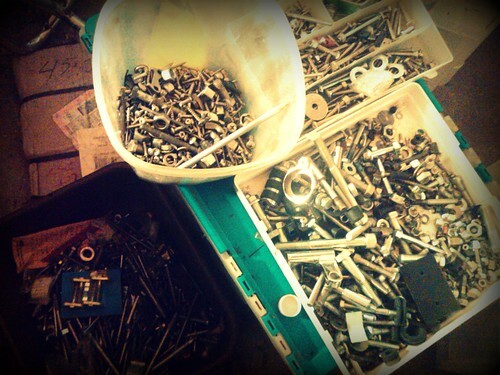 You're on the hunt for three sets of nuts and bolts that fit together and six washers. You might as well grab one of the buckets-o-metal bits and have a seat. This is bound to be the longest and most tedious part of this project. In fact, did you grab one of those beers you told your husband to have? If you didn't, this is probably the time to rethink that mistake and go back to the house for one. You'll also need to find two drill bits: one that is just a tad bigger than the diameter of the screws you find and one that is just, well, big. 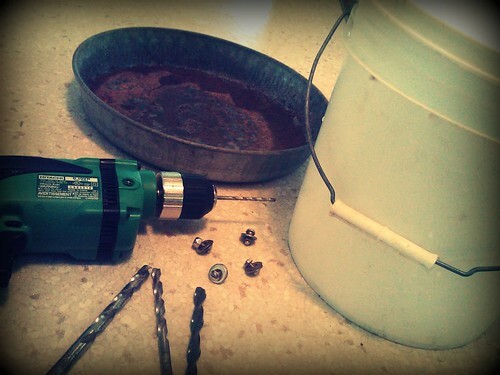 STEP 5: You should now have your bucket with lid, a tray, a drill, drill bits, and your nuts, bolts and washers. If you haven't done so yet, make sure that your bucket, lid and tray are clean and dried. Spread them all out on your floor professional gravity-enhanced work surface. STEP 6: Remove the lid from the bucket. Use a smallish size (yes that is a technical sizing term there) drill bit and drill some pilot holes at the bottom edge of your bucket sides. 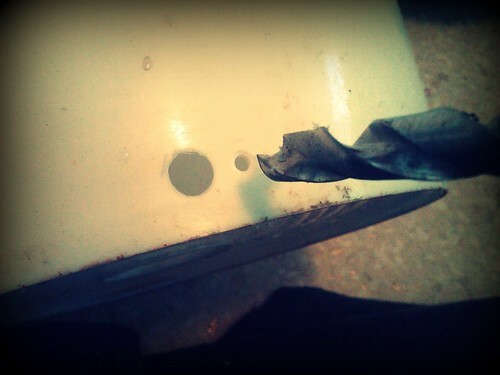 Then go back with a bigger drill bit and expand the holes until they are big enough for grain to come through (I drilled three holes together to make one big hole, and did about 3-4 inches apart all around the bottom). You'll want these holes as close to the bottom as possible. STEP 7: Turn your holey bucket upside down and then set the tray pan on it upside down as well so that the bucket's bottom is somewhat centered in it. Perfection is not necessary since, at least in our case, chickens don't have measuring tapes and are therefore not going to fuss and whine if the bucket is not properly centered in the tray. If they are, they need to be building their own darn feeders. 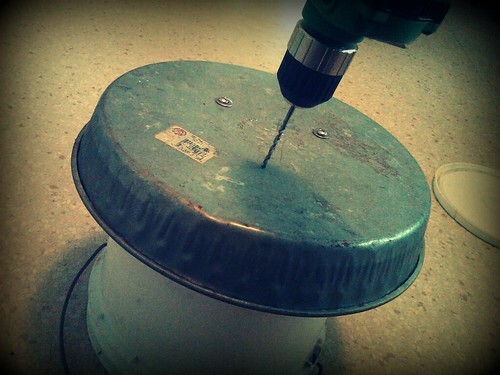 Put the smaller drill bit back onto the drill. You are now going to drill CAREFULLY through the bottom of the tray as well as through the bottom of the bucket all in one swoop... this is where you are going to bolt the tray to the bucket. I strongly advise that you drill one hole, put a washer over the hole, shove a bolt through it, put a washer on the other end and go ahead an secure it with a nut before drilling the next hole. Otherwise you'll start cussing. Believe me. I think I even offended my cat. You can see in the picture above that I have two bolts in and I'm working on the third. Or so it seems. This is actually me posing for a picture after I realized I shouldn't have drilled all the holes at one time. Anyway... I honestly don't think it matters if you put the nuts on the inside of the bucket or on the bottom. I put the screws on the bottom because it looked better. 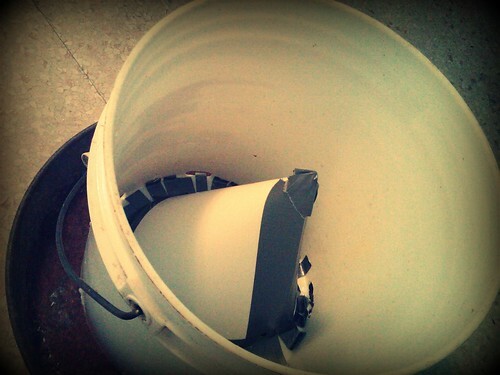 STEP 8: Turn your bucket over and admire how cool it looks. Make sure you clean out any plasticy bits from all of the drilling and hole-making, as they are not a good part of your chickens' balanced diet. STEP 9: Now here is the tricky genius part that you can tell your husband you thought up all by yourself. You'll need to insert a magical something into your bucket. I suggest something plastic with a tapered shape. Old cheap flower pot, a funnel, upside down big yogurt container, etc. My picture shows my first (and failed) attempt to use a cone made of card stock. It didn't last long, which is why I'm urging you to find something plastic. Hunt in your recycle bin and find what you need. Then secure it to the bottom of the bucket. 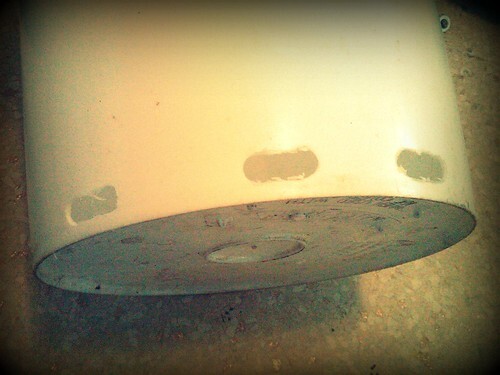 If the magic object has holes in it (ie your funnel or flower pot) be sure to cover the holes. I secured mine with duct tape. The purpose of this magic addition is that it will help keep the chicken feed directed toward the holes and therefore help push the feed out into the tray. I'd like to say that I came up with the concept but I saw it done on many websites and forums. So for the sake of this blog we will mark it up to some good Google-fu but just don't tell your husband. It's ok. Husbands regularly recreate the wheel just for the sake of saying they did it better, so a little fudging on the genius details is ok in my book. Take the credit and run with it. STEP 10: You're done!! Take your new chicken feeder outside and show it off to your unsuspecting husband. Make sure you talk about how labor-intensive this project was and how every single measurement and detail in some form is crucial to the overall functionality of the feeder. Point out the genius magic funnel. 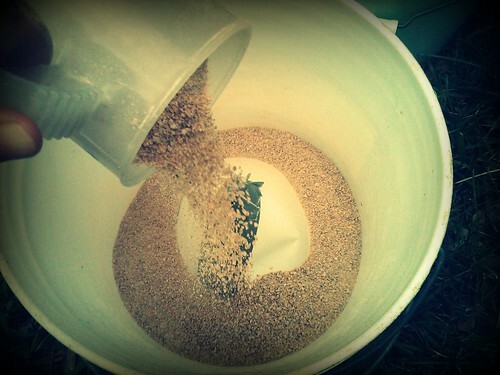 STEP 11: It's now time to fill your new feeder with chicken feed. Look over your shoulder and seek the approval of the Supervisors of All Things Interesting On The Other Side Of The Fence. Pet them on the nose and then go plug in the electric fence because they aren't supposed to be leaning over it like that. 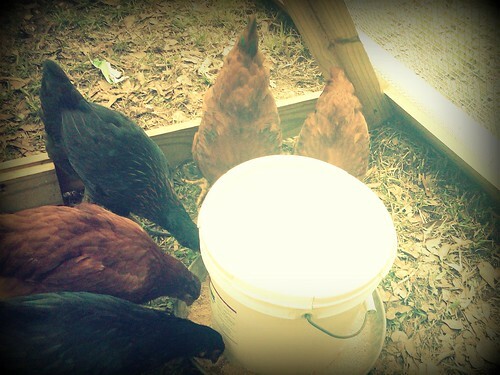 STEP 12: Feed your chickens! 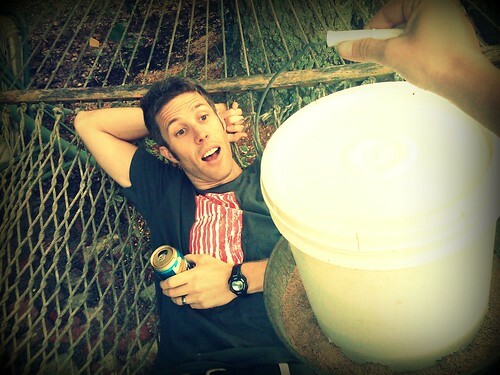 If your bucket has a handle on it, you can hang it. Mine is on the ground temporarily until it is hung. The chickens don't care. They just want to eat. When you hang it, you want the tray part to be about level with your chickens' backs. 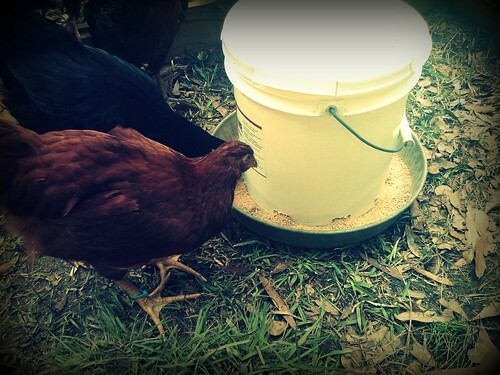 STEP 13: Don't forget to tell your husband how much money you saved by making your own chicken feeder!! Show him one on Amazon (about $30), and then of course add in the shipping costs and impulse gatta-have buys and you've easily saved him $150 for sure. If you play your cards right, you may make him so proud that he offers to take you to dinner. Superb post! I'm saving it for my future chicken raising days. Great pics, too. My favorite part of this is the shocked and delighted look on the unsuspecting husband. Hee hee. Great post, I have seen this before but never written this funny. Thanks for the post....I'll cross it off my husbands to-do list right after I post this... and hopefully I'll get a dinner date out of my chicken feeder too! 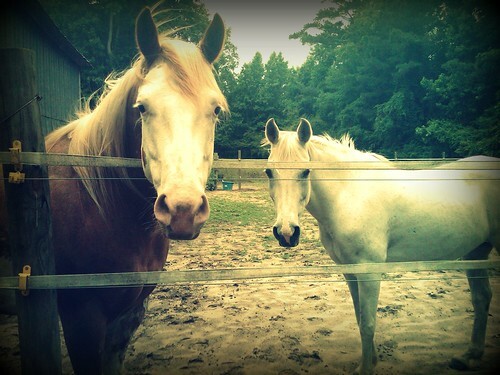 Cutest blog!!! Very witty :) Thanks so much!!!! here is something about wandering around outside to see what inspires you to bring it indoors.